Toymaker Fisher-Price has a clever solution for parents looking to give toddlers guilt-free screen time. The company announced on Wednesday the Think & Learn Smart Cycle, an exercise bike with a tablet holder tacked onto the handlebar. The bike, aimed at 3 to 6 year olds, lets kids interact with gaming apps while pedaling. The Smart Cycle ($150) comes with one free app and works with four others, including SpongeBob SquarePants and Shimmer and Shine apps ($4.99 each). The included app features an age-appropriate curriculum based on math, science and social studies. "They're learning and mastering content as they pedal, fast or slow, forwards or backwards," Amber Pietrobono, a spokeswoman with Fisher-Price, told CNNMoney. "It's also how they level up in the games." Fisher-Price's Think & Learn Smart Cycle is expected to hit stores late summer/early fall 2017. The system is Bluetooth-enabled so the bike could work with the apps played on platforms such as Apple TV and Android TV. App dashboards tell parents how much time their child has spent peddling and what he or she has learned in that duration. This is Fisher-Price's second iteration of the Smart Cycle, one of its most successful product launches ever. The company launched the first version in 2007 using basic TV plug-and-play technology. The toy came with gaming cartridges that connected it to a TV. Kids pedaled through different environments, used a joy stick to learn letters, numbers and colors and were able to race against virtual vehicles. 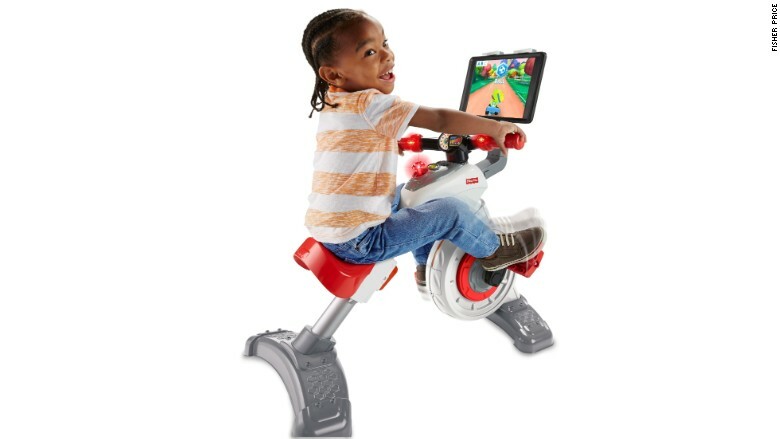 Fisher-Price said some kids used the original Smart Cycle for up to an hour at a time. Toy industry analyst Jim Silver said its popularity was fueled by a growing trend to encourage kids to be more physical. "Fitness and childhood obesity were hot topics at the time," Silver said. "This got kids to exercise as they learned." Considering concern around childhood obesity is greater than it once was, the latest version will likely appeal to parents in a similar way, Silver added. In the 10 year gap between the two Smart Cycle versions, Fisher Price has also updated the technology to make it relevant for kids. "It uses apps with powerful and engaging graphics," Pietrobono said. "Kids can also save games and resume them when back on the bike." 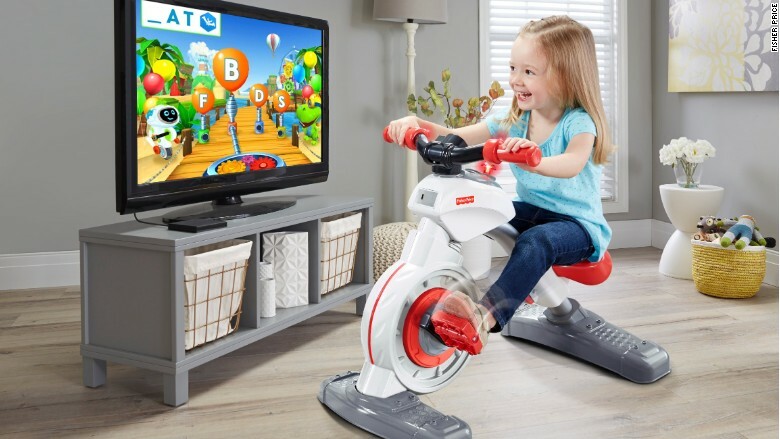 The Smart Cycle, which will hit stores in the fall, is part of Fisher-Price's line of activity-based toys. Last year, the company launched the popular Code-A-pillar toy from the same line. However, it appears the Smart Cycle might have some competition on the horizon. Silver hinted that competitors are already working on a similar product to launch later this year.